Summer is the time for fresh vegetables and herbs! The northeast has a large variety of produce that comes alive in the summer months. Eating local vegetables in season ensures a fresher, more nutritious product and lowers the environmental impact. Check out local farmers markets, roadside farm stands or even join a Community Supported Agriculture (CSA) group! Learn more about 6 of our favorite summer veggies! Basil is a green leafy herb with a sweet and spicy flavor. This versatile herb can be used to add a kick to anything from tomato sauce to sandwiches and can be dried as a seasoning for meat and vegetables. It is especially high in vitamin K, which is important for blood clotting. 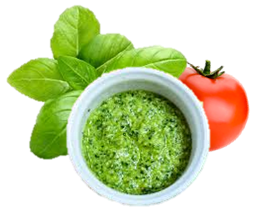 Basil is most commonly used as the main ingredient in pesto sauce. Combine basil with olive oil, garlic, Parmesan cheese and pine nuts for a savory sauce. Basil in short supply? Use half spinach to add bulk, while maintaining the color and flavor. Many kinds of nuts like walnuts and almonds can be substituted for the pine nuts. Add roasted red peppers for a twist on a classic pesto! For light refreshing summer snack combine tomato, basil and mozzarella and finish with a drizzle of balsamic vinegar! Summer squash comes in two varieties: yellow and green. The green variety is also known as zucchini. Summer squash is lighter than winter squashes like pumpkins and butternut squash. Use a vegetable peeler, spiral slicer or a mandolin to cut the squash into thin strips for a lighter, more nutritious spin on pasta. Add any sauce or seasoning that you would add to regular pasta. We recommend the pesto sauce above! Beets are a great way to bring color into your diet. These bright red root vegetables can be eaten in a variety of ways including shredded, roasted, boiled, juiced or even pickled! You can also add the greens to a vegetable stir-fry to reduce waste and get the most out of your produce. Beets are especially high in folate and magnesium as well as a variety of other vitamins and minerals. Roast in the oven with olive oil and spices; slice and top with goat cheese and walnuts for a warm melty treat. Eggplant is a versatile vegetable that can be used in many types of cooking because the spongy texture quickly absorbs the flavor of what it’s prepared with. Though mostly known for its deep purple color, some varieties come in indigo or even white. “Graffiti” eggplant is somewhere in-between! Slice thinly, marinate with a bit of olive oil and your favorite seasonings and throw on the grill along with your burgers and hot dogs for a tasty and healthy addition to your BBQ! Corn is a staple in many households and is a summer classic. Corn is native to North America and has evolved significantly in the past few centuries to become the crop we know today. Although sweet corn is the most common corn sold in supermarkets, it comes in several different varieties. Each has special properties and uses. Some are colorful or have tougher textures. Some are as animal feed while others are better for popping! After grilling corn brush a mixture of butter, lime juice and adobo sauce onto the cob. Adding lime juice to corn is an ancient practice known as “nixtamalization.” The chemistry of the lime juice releases essential B vitamins increasing flavor, aroma and the nutritional content of the corn. Cauliflower is generally known as the less popular relative of broccoli, but it’s been gaining attention in recent years as more people discover the versatility of the vegetable. Cauliflower can be eaten raw or roasted and can even be blended and used as a dairy substitute in creamy sauces. For a fun and healthy appetizer, core the cauliflower leaving the head intact and coat with olive oil and the spices of your choice bake until tender.